Minuteman Press in Dorset are a printing company in Poole offering a great range of printed products in the Poole and Bournemouth area. Their team of experienced printers in Poole can take care of everything from design to print and most items are available with their same day print service. Whether you are looking for printed menu’s, promotional banners or printed fabric for your exhibition stands, Minuteman Press have the expertise to help support your business. 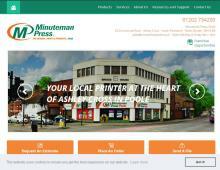 Contact Minuteman Press in Dorset if you are looking for printers in Poole or Bournemouth. Do you need a same day printing service? We can offer emergency printing services in Poole on many products, so please call us today.